Posted January 27, 2007 in 2007/01, Uncategorized, z Archive. 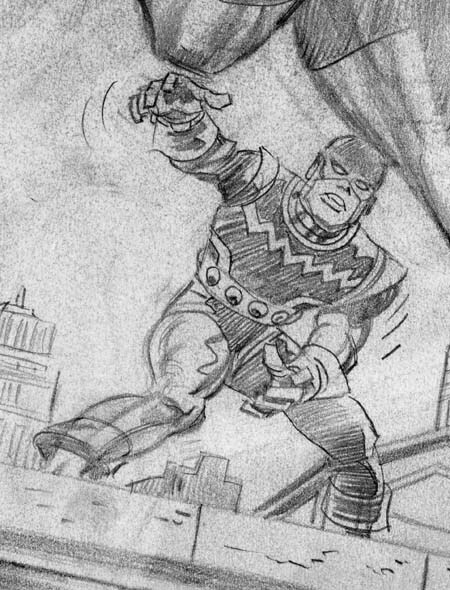 Next week I hope to do the final chapter of my serial blog, Early Jack Kirby. But if that does not work out I should be able to get my first of a set of posts on Foxhole. Who knows maybe I’ll have both done? Posted January 26, 2007 in 2007/01, 4 DC (early), Featured Work, Periods, Topic, z Archive. It was late in the war and both Jack Kirby and Joe Simon were performing their military service. Nonetheless the cover for Adventure #95 was clearly penciled by Jack. 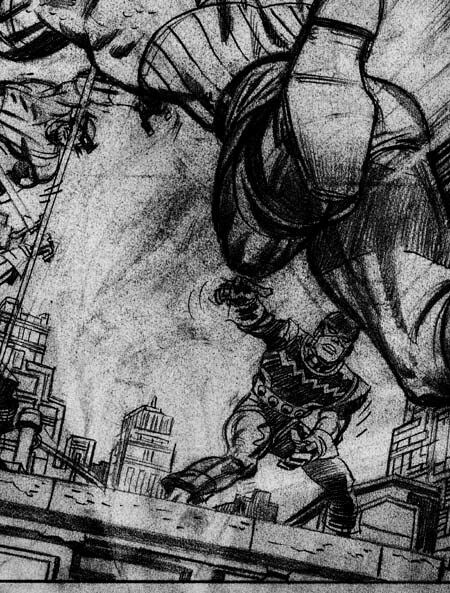 Earlier while working for DC and knowing that they would be called to duty, Simon and Kirby had backlogged art for DC to publish while they were gone. It is an indication of the importance that S&K gave toward covers that the stories they provided for Adventure Comics ran out months ago (the last in April 1944) while they still left enough covers to last a few more months to come (the last would be for April 1945). Jack was under a lot of pressure to produce his art quickly before entering the service. However you could not tell it by looking at this cover. The cover was both beautifully composed and drawn. I use the term ‘beautifully’ to describe the manner of execution not the subject matter. One would hardly use that term to describe either the Japanese or the German officer. Today such depictions would not be considered politically correct. During World War II what was considered correct was politically something very different. Germany and Japan were our mortal enemies and as such their appearance were meant to reflect their “brutal nature”. Certainly Kirby has captured that quality in this cover. In order to be truly patriotic it was not enough to depict the enemy negatively, one also had to make fun of him and show the superiority of Americans. The Japanese officer smugly shows his German counterpart an announcement of the capture of Sandman. But of course this was obviously all part of Sandman’s plan because there he is with Sandy ready to pounce on the as yet clueless pair. That this scene was supposed to be taken place in Japan can be shown by the soldier that Sandman has so quietly subdued. Another clue is the woodwork on our left. I am no more a student of Japanese architecture then apparently Jack Kirby was. But I strongly suspect you would find nothing like this woodwork in Japan. Even so the unusual nature of this wooden frame was meant to suggest the orient and therefore Japan and not America or even Germany. As if their appearances alone are not enough to label the officers as foreign, Jack provides a monocle for the German and cigarette holder for the Japanese. I find it interesting that the same symbol, in this case the cigarette holder, was used to identify someone as foreign and at the same time be such an important part of the image of that American icon, President Franklin D. Roosevelt. Posted January 21, 2007 in 2007/01, Uncategorized, z Archive. 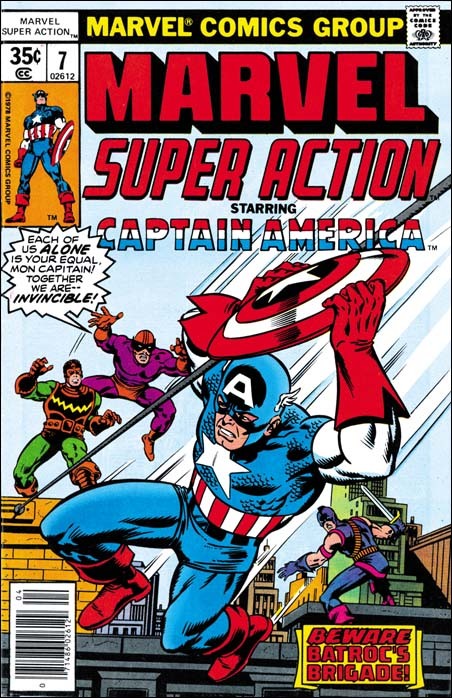 If things go as I plan, next week I will have a post on a silver age Captain America cover. 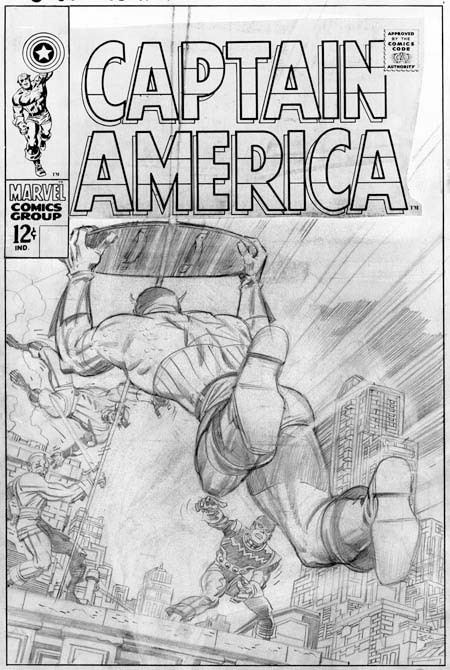 I will be tracing the influences on this cover back to the early days of the golden age of comics, before Captain America was even created. Also discussed will be the various artists that were involved in the creation and/or destruction of the final cover. Included will be some images of some rough work that I do not believe has ever been published. So see stay tuned. Posted January 21, 2007 in 2007/01, 7 Freelance, Featured Work, Periods, Prize, Topic, z Archive. In a comment recently, Mike made a request for post on Fighting American. Well it happens that I just finished restoring the cover to Fighting American #3. 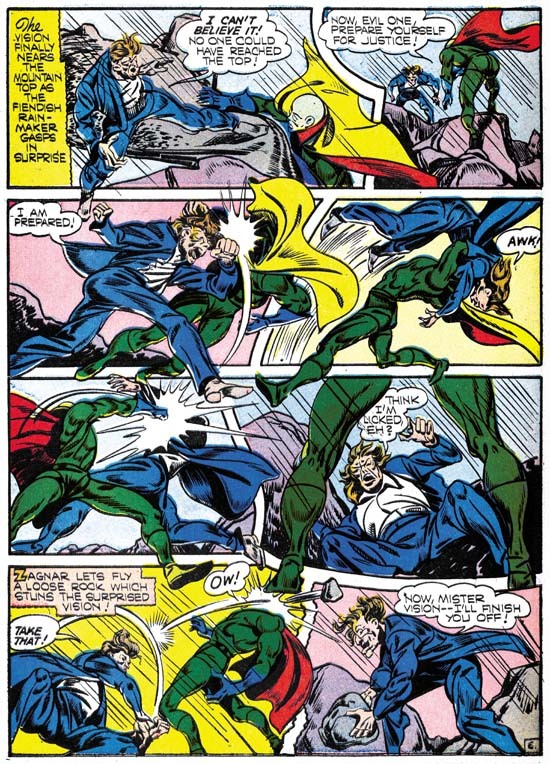 The first two issues of FA were pretty much the standard action hero format. 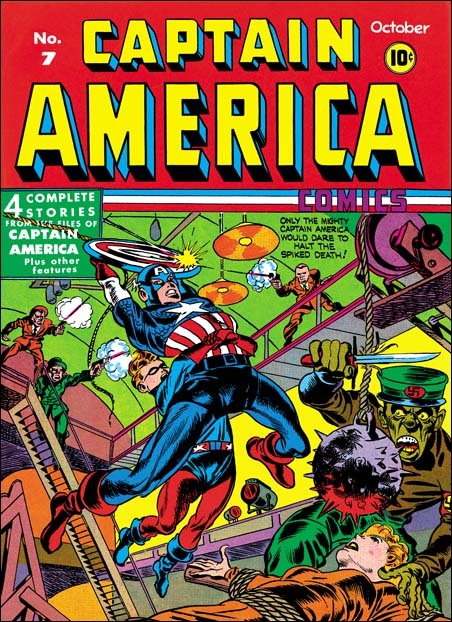 Fighting America and Speedboy were Simon and Kirby’s remake of their own patriotic heroes Captain America and Bucky. 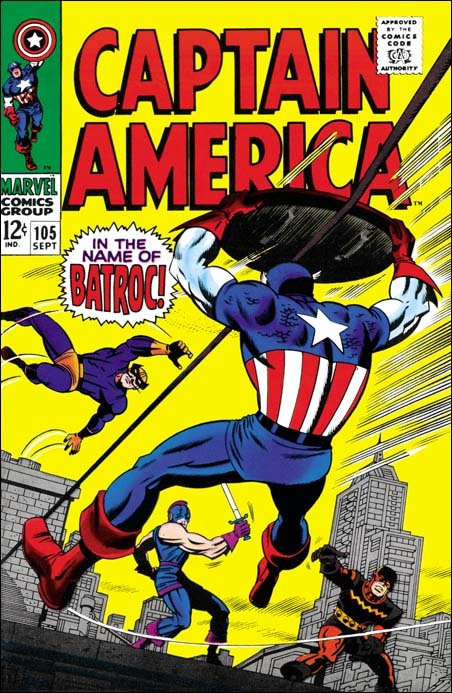 Atlas Comics had recently brought out a cold war version of Captain America along with the Human Torch and Sub-Mariner. However the times had changed and despite Joe McCarthy, or perhaps because of him, the public did not consider the Communists as quite the same threat as the Nazis. 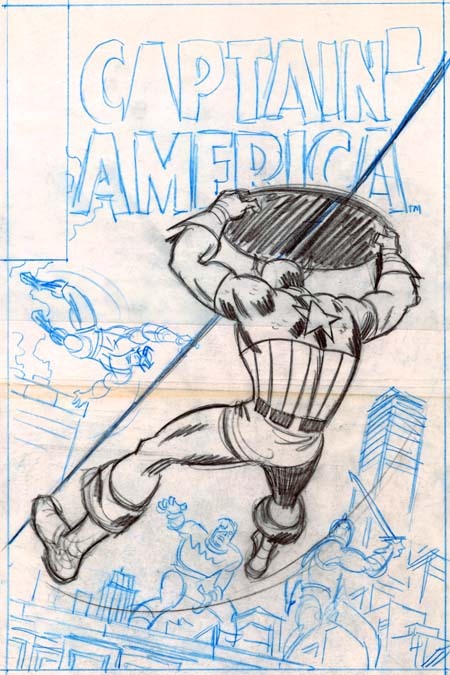 Atlas Comic’s Captain America did not last long but Simon and Kirby adjusted to the times. With issue #3, Fighting American adopted a more humorous approach. Yes the Commies were still the villains, but nobody was meant to take Poison Ivan and Hotsky Trotski seriously. Posted January 21, 2007 in 2007/01, 3 Timely, Assorted, Featured Work, Periods, Topic, z Archive. Professor Enric Zagnar is the leading authority of metaphysics in the country. But he is forced to resign because of his predictions that man will one day be able to control the forces of nature. He retreats from the town vowing revenge and dedicates himself to uncovering the secrets that would make his predictions come true. A short while later a storm hits the town. This is no ordinary storm but one with much fury and persistence. Smoke from a lightning strike of a tree allows the Vision to enter to save the people of the town. He directs the townsmen to climb the nearby mountain in order avoid the flood that forms. But before the people can reach the top a blast from dynamite prevents them from going further. It is Zagner at the peak, relishing his revenge. Zagner urges the storm on using a spell that he reads from a book entitled “Black Magic”. The Vision proceeds to climb in an attempt to stop Zagner. Seeing the Vision, Zagner in turn rolls down a large boulder and when that is unsuccessful throws more dynamite. Despite all this the Vision reaches the top and a fight with Zagnar ensues. Though a dirty trick Zagnar defeats the Vision. Just when he is about to deliver the coup de grace with a large rock, Zagnar gets hit by a bolt of lightning from his own storm! The Vision recovers and reads out the counter spell from the Black Magic book to end the storm and save the day. 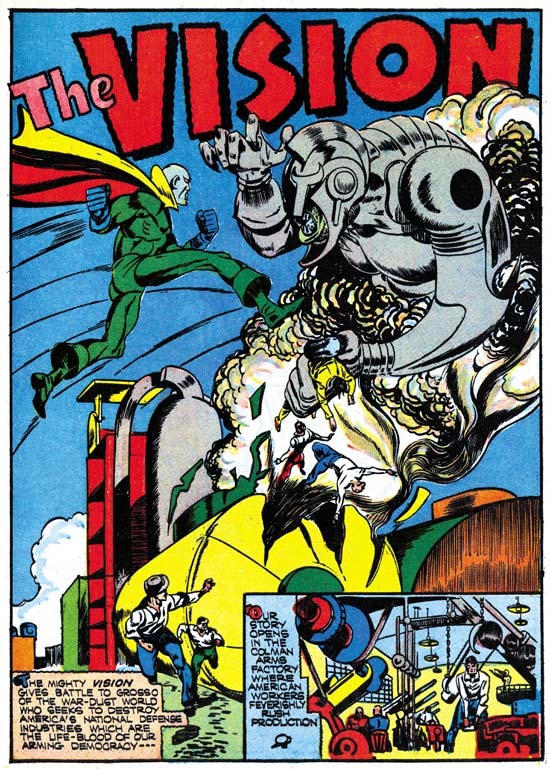 As with the Vision story from Marvel Mystery #24 this splash page makes use of over sized figures. Note the small houses being washed away by the rushing water. I really like the way the title separates the Vision from his foe. The only fault I find with this exciting splash, and it is a minor one, is the “pinning” of the “The” in the title. It seems so unnecessary for this splash. Further it really fails as trompe l’oeil. Not only does the pin not look realistic but also the sharp end is visible so how is the title “pinned” down? The title of the book that Zagnar uses, Black Magic, is a common enough term. Still it seems interesting that of all the possible titles that Simon and Kirby could have chosen they picked one that they would use again for a comic book that they would launch about nine years later. 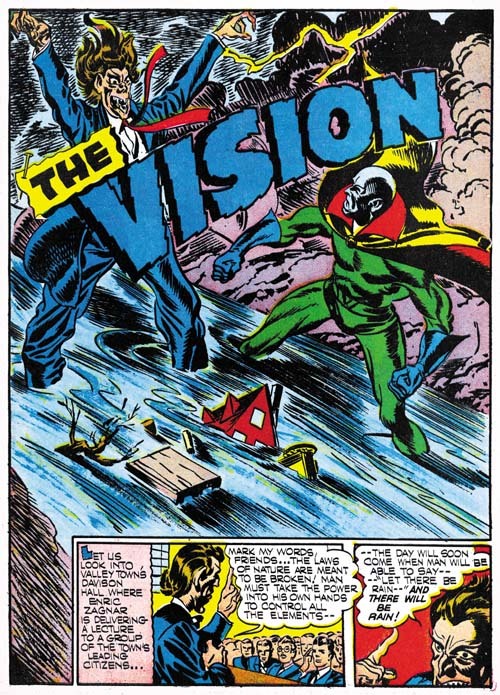 The Vision is an unusual hero for a comic book. Comic book art depends on the visual image to provide an indication of the character. Heroes are handsome, heroines beautiful and villains ugly. Although the hero, the Vision is anything but handsome. Of course what Simon and Kirby are doing is to use the Visions unnatural appearance as an indication that he is not of this world. I was just simplifying things when I said villains are ugly, a good comic book artist will go well beyond just making the foe ugly. With his name, Enric Zagnar, is marked as different. Although foreign sounding the origin of the name was probably purposely left ambiguous. Notice that in the first two story panels at the bottom Kirby provides Zagnar with what was then considered long hair. Such hair length was the mark of an intellectual and appropriate for the then Professor Zagnar. In the first panel Zagnar looks fairly normal (but there are those big ears that Kirby would often draw with heads viewed from the back). The next panel provides a glimpse of Zagnar’s already disturbed personality heightened by being partly cut off with the panel edges. The splash panel provides what Zagnar will look like when he becomes at the end of his transformation. You do not need the eyes or the grotesque mouth, the hair alone reveals that Zagnar has gone way past the edge of sanity. Posted January 14, 2007 in 2007/01, Uncategorized, z Archive. Well I did not get much response from Delurker Week. Unfortunately there are a number of projects that I want to do with not enough time to do them all. With such a small readership it is hard for me to justify spending as much time on this blog as I have in the past. So I will be posting on a less frequent schedule. I believe my next post will be sometime next weekend. I would like to thank those who did leave a comment for Delurker Week. Frankly your kind words are the main reason I am continuing this blog at all. David suggested posting on how I do my comic art restorations. I do all my work in Photoshop. But I do not want to get more detailed then that here. Not because I want to keep my technique secret but because I know from previous experience that there really is not much interest in such technical information. 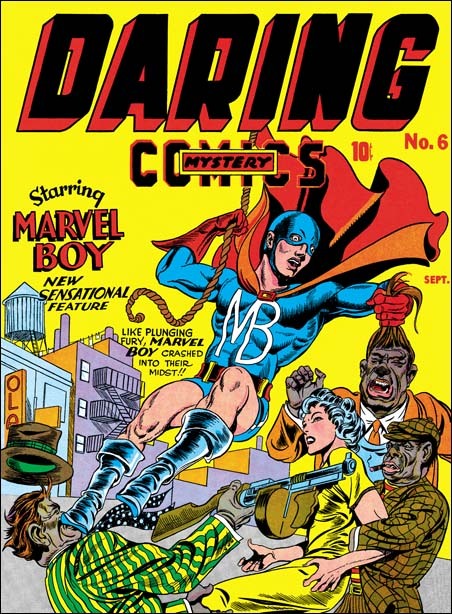 If anyone really does want to know more I suggest joining the Digitizing Comic Books group. It is pretty much an inactive group but I posted there on the basics of my color adjustment method. So you can go through the archives and check the photo section for images that were attached to my posts (Yahoo does not archive images). If you have further questions you can ask them there (I am the moderator). Posted January 11, 2007 in 2007/01, Uncategorized, z Archive. It has taken me by surprise. I have read on some of the blogs I visit that it is Delurking Week. But boy is it welcome news. Seriously I know that the Simon and Kirby Blog has a narrow focus. I never expected it to be a popular blog. Nor have I ever thought I would get many comments. Frankly I do not leave comments on most of the blogs I read. But still there are times that I wonder if anyone out there really cares. So this is your chance to step up and provide me with some encouragement. To all readers, please leave a comment to this post. I really don’t care what you say. Just say “hello” if you cannot think of anything else. But please, please, please leave a comment here. Then if you like, return to your lurking. P.S. Don’t be surprise if your post does not appear right away. It quite likely will get caught by my Spam filter. You would probably be amazed about how much Spam this site gets. But I go through it all daily to accept valid comments. Generally once a commenter gets accepted they never get stopped by the filter again. Since most of the blogs that I read have not picked up on Delurking Week I just want to make sure no one makes the mistake of thinking that I am just kidding. Two blogs that I read that have joined this movement are Pharyngula and Afarensis. If you go through their comments you will find I stopped lurking long enough to say I enjoyed their blog. As can be expected, not all bloggers are looking to Delurking Week to provide the same thing but I am sure we are all looking for some sort of approval. What I want to do is take this opportunity to see how many people care about my blog. Frankly if a reader does not care enough about the Simon and Kirby Blog to to say “Hello” then as far as I am concern they simply do not care. After all it does not cost anything, I do not believe you have to leave your real name, your email address will not get published or put on any lists and I would prefer if you do not put anything in the “Website” entry (so I do not mistake you for spam). Posted January 11, 2007 in 2007/01, 3 Timely, Assorted, Featured Work, Periods, Topic, z Archive. In my serial post on “Early Jack Kirby” I commented that I regretted that I only had a few scans of The Vision from Marvel Mystery Comics. I find those that I have very enjoyable provided that to do not let some of the logical inconsistencies bother you. I believe the only way to enjoy any superhero story is to not take them too seriously. Actually I rather enjoy the inconsistencies. The Vision lives in another dimension, entering and exiting this one through smoke. The sole purpose of his visits to Earth seems to be fight evil, which despite the war going on in Europe and Asia, somehow only occurs in America. In this story his foe is someone the Vision is already familiar with. It is Grosso from the war-dust world who has a similar mode of transportation as the Vision only instead of smoke uses metal dust. Grosso comes from a world that relishes war and he has decided that our dust free world would be a suitable place for his people to live and easy to conquer. Grosso method is to enter a weapon factory via the metal dust they produce and destroy it. 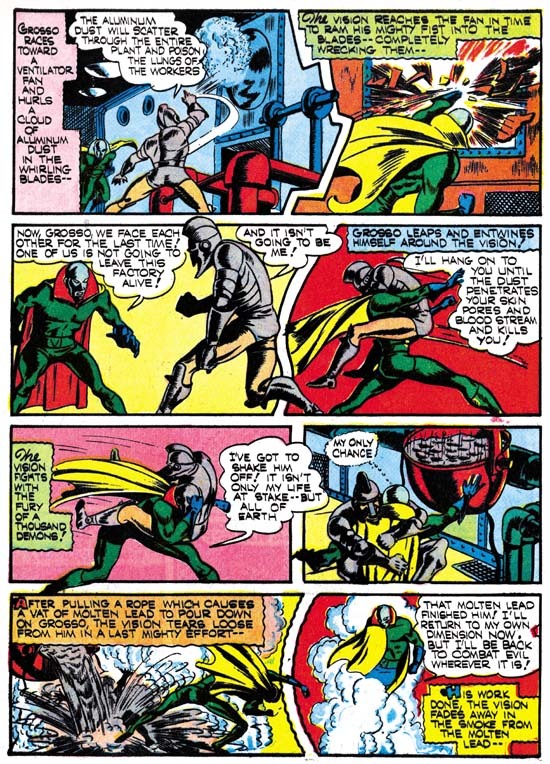 The Vision soon detects the presence of Grosso’s evil and enters into battle with him. Grosso does seem to have some advantages. One is that he is able to control how fully he is in this dimension. When Grosso is only partly in our world the Vision is unable to touch him. Grosso is also able to use metal dust as a weapon or even a poison. But the biggest difficulty that the Vision faces is that he does not know where Grosso is going to attach next. The Vision puts on a hood and some glasses as a disguise and gets hired at the largest factory expecting that Grosso will turn up. He tells his employer that he hides his face because it was disfigured when a factory was destroyed by Grosso. The ability of the Vision to appear as a normal mortal that was seen in the first Vision story now seems gone. Also surprising is that nobody seems to make any comment about the disguised Vision’s green hands. Of course in the end the Vision soundly defeats Grosso. It would even appear that Grosso was killed, but we all know how often a good villain stays dead. This Vision story came out toward the end of Simon and Kirby’s stay at Timely and it shows. 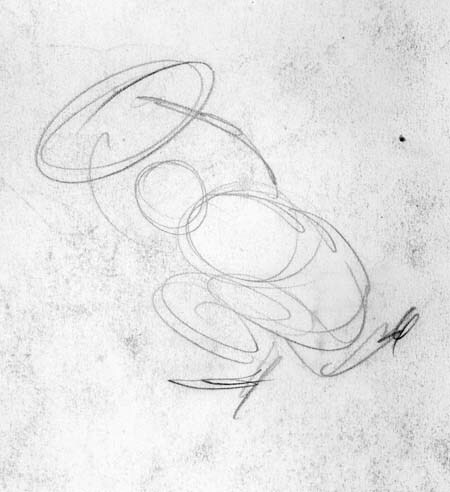 Included are lots of irregularly shaped panels, figures that extend beyond the panel edges, running figures with legs stretch out to an unrealistic degree, and square fists. The splash page is particularly effective. Note how over large the figures of the Vision and Grosso are. Such use of over sized figures was not typical for Kirby through most of his career. On the other hand Joe Simon did use large figures from time to time both before teaming up with Jack and after their split. Covers create by Simon and Kirby at Timely never used this motif but over sized figures occur often in their Timely splashes. Check out the dialog from the third panel on page eight. Vision: Now, Grosso, we face each other for the last time! One of us is not going to leave this factory alive! Grosso: And it isn’t going to be me! Cap: and it won’t be me! In this case comes out wrong no matter how many times you read it. Because the story was done by the Marvel method it is not clear whether this snafu should be blamed on Jack Kirby or Stan Lee. Despite the fact that the Vision and Cap stories were done about 20 years apart, the similarity between these two scripts make me suspect that it was Jack who came up with Cap’s goof-up. Posted January 10, 2007 in 2007/01, 4 DC (early), Odds & Ends, Periods, Topic, z Archive. 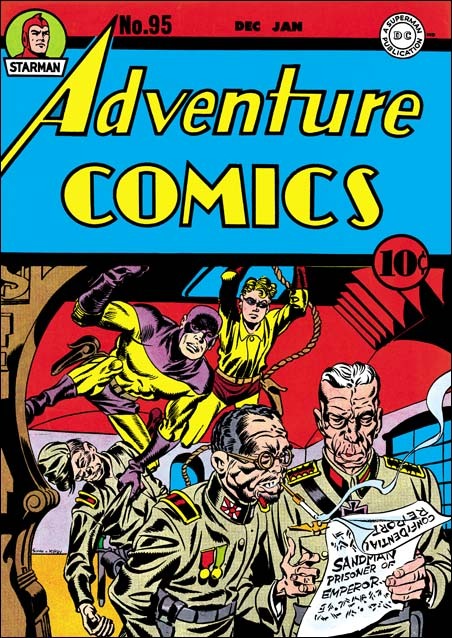 Recently on the Kirby List scholar Stan Taylor queried about a Boy Commandos ashcan that appears in the GCD. I am not sure what the proper Internet etiquette is so I do not want to link directly to GCD’s image of this ashcan. So to get the most out of what I will write here, it would be best to make a new window and following my link to GCD and search for Boy Commandos. You will end up with 3 results, one of which is clearly marked ashcan. Although the GCD lists two ashcans (1 and nn) an image is only provided for #1. Ashcans are used by comic publishers to secure the copyrights to a comic book title. I have heard some people say it is to get the trademark, but I believe you have to register trademarks not secure them by publishing them. But I am not a lawyer so I could be wrong. Anyway only a few copies of a particular ashcan would be made and none would be sold. Generally existing artwork would be used, and the inside story might not even match the cover. Ashcans are typically black and white, without color. I have never had the opportunity to closely examine an old ashcan but since Xerox did not exist during the golden age I suspect the are made from stats. If so they could not have taken long to make, in fact they were probably made using whatever stats that were available on hand. 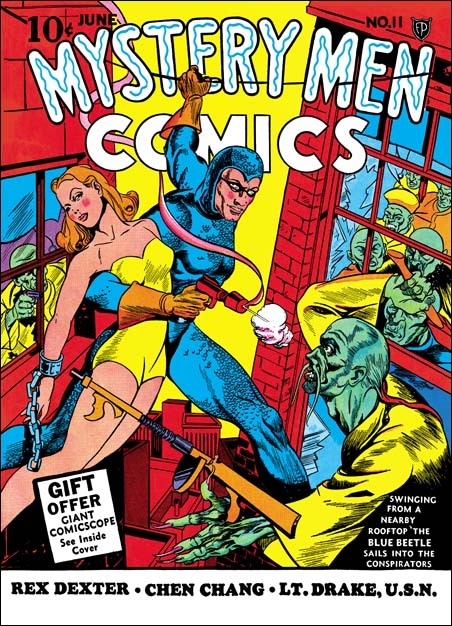 Once an ashcan comic served its purpose the copies could be discarded, hence the name ashcan. The Boy Commandos ashcan is dated Sept./Oct. and there is a copyright below for 1942. Notice that there is no trademark indication so at least in this case copyright seems to be the purpose. Stan’s original question was had the art for this ashcan cover been published before? 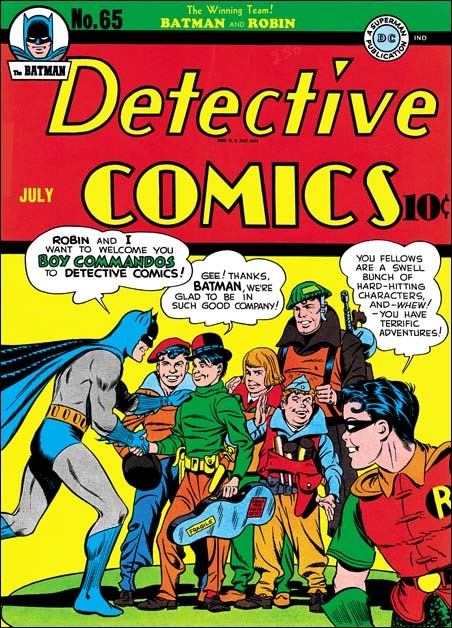 By a coincidence I had recently borrowed Joe Simon’s copy of Detective Comics #68 for scanning and could verify that the cover was the same as the splash page for the Boy Commandos story in that book. There are some differences, mostly in all the paste-ups. 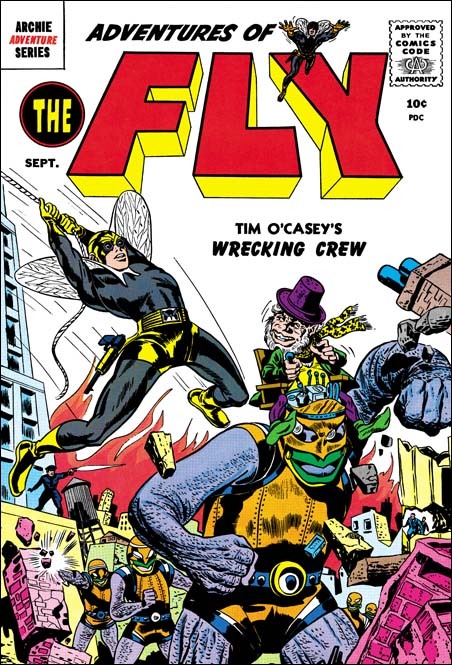 The main difference in the artwork is a group of planes that appear at the top of the splash page show up on the center right on the ashcan cover, and one of the planes was left out in the ashcan version. The splash page appears to be the original because you can still see on the ashcan an abrupt stop to some smoke where the left edge of one of the paste-ups had been. The planes where moved because they would have been covered by the title of the ashcan. 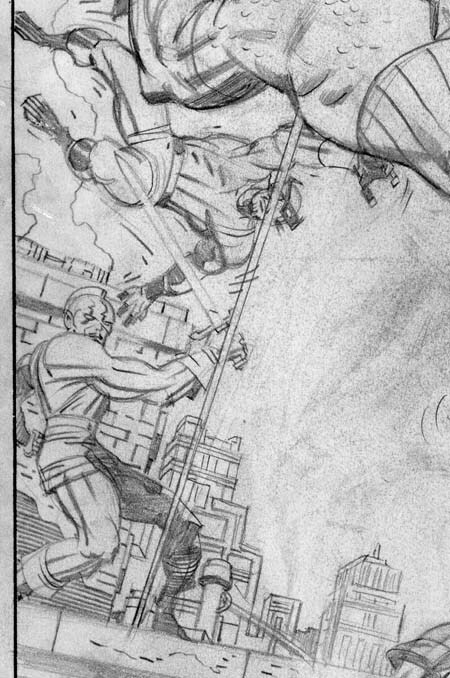 Some smoke lines were also added on the ashcan in a manner very different then what was done on the rest of the art. My original reaction to this ashcan was that DC was just trying to cover their basis and protect copyrights in case they ever decided to actual publish a Boy commando comic. 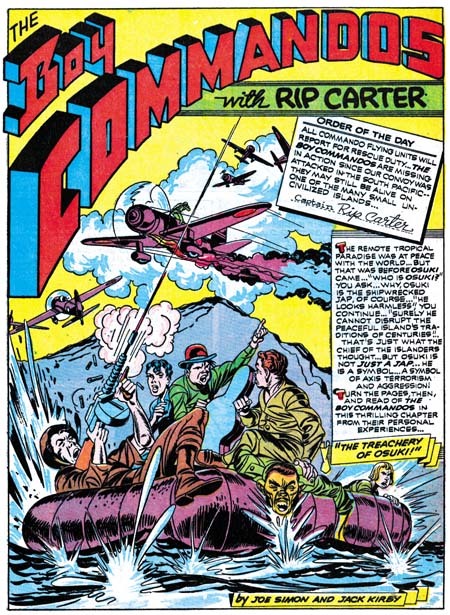 I thought that it was probably too early for DC to realize that the Boy Commandos were a hit. 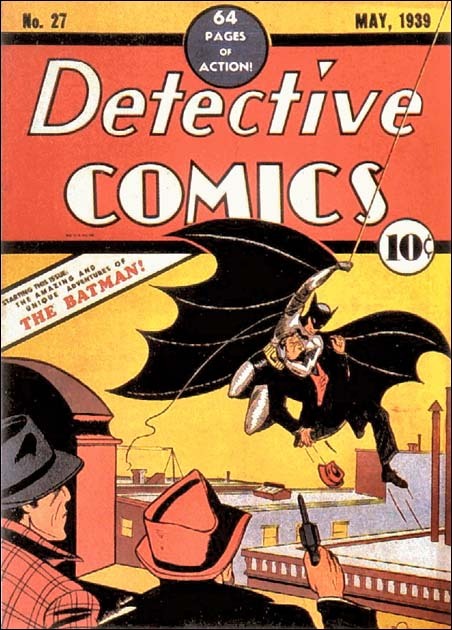 The Boy Commandos were introduced in Detective Comics #64 (June 1942). They were a backup story to a comic whose principal feature was Batman. Judging from the date and art of this ashcan it was made only four or five months after the first Boy Commandos story. That means that when the ashcan was made the first story had only been out on the newsstands a month or two. I did not think that would be enough time for DC to realize that it was successful enough to warrant its own magazine. What convinced me that my original impression was wrong was the logo. The ashcan cover does not use the same logo as the splash page. I have not seen all the early Boy Commando stories but all that I have seen use the same logo. 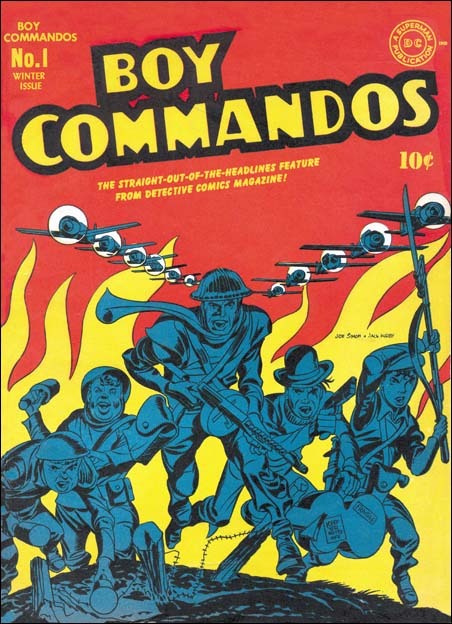 The logo for the ashcan is instead the logo that would be used on the actual covers for Boy Commandos Comics. I do not think DC would have gone through the trouble to make a proper logo for the comic if they did not think they were actually going to create a book to use it on. Even in the short time the Boy commandos had been out there must have been some sort of response that convinced DC that the feature deserved its own title. Joe Simon has always said that Boy Commandos was a top seller. 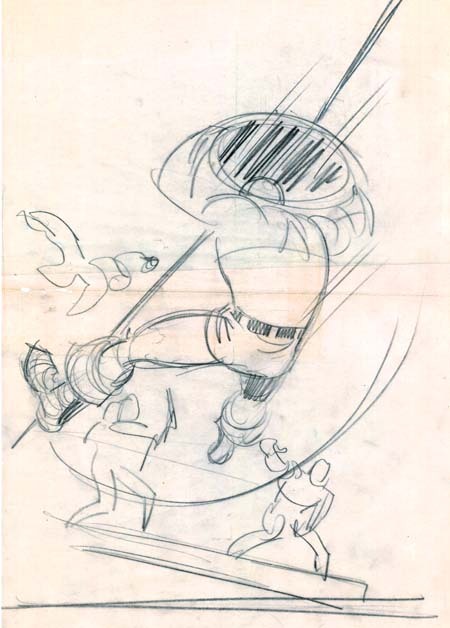 Sandman and the Newsboy Legion, other Simon and Kirby features for DC, never got their own titles.